What are the Risk Factors for Lead Poisoning? 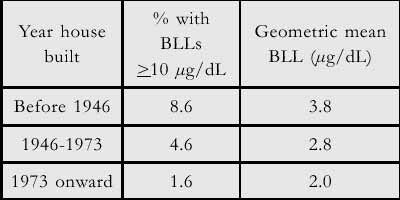 Percentage of children ages 1-5 years with BLLs greater than 10 µg/dL by year house built. Lead Paint. The most significant exposure to the risk of lead poisoning in your children is lead based paint. As lead based paint has been banned in the US since 1978, those children who live in or spend considerable time in homes built prior to 1978 are at risk for lead exposure. However, the greatest risk lies in homes built before 1950. Not Limited to the Poor. What we believe to be one of the mistakes of the governmental approach to lead blood testing, is that the government has identified this as a problem that is largely limited to the poor. For example, the CDC manual that has been developed to guide states in implementing the federal lead surveilance program, places a priority on testing those children who receive services from public assistance programs for the poor, such as Medicaid or foodstamps or AFDC. Older Homes. However, the risk factor that is most important is not family income, but the age of the home in which the family lives. And while traditionally there may have been a substantial relationship between the age of the home and the income of those who lived in it, that has changed significantly in the last decade. Substantial areas of the central part of our most densely populated cities, have been repopulated with high income families. The term "gentrification" is used to describe this phenomenon. Buildings that were on the brink of demolition, are now million dollar residences. Restoration Increases the Hazard. Yet in the process of restoring and remodeling these previously decaying structures, the hazard of lead paint may actually have been increased. Not enough recognition has existed about the perils of this toxin, and the sledge hammer, the electric sander and paint removers often increase the hazard. Lead paint can only safely be removed by a certified lead paint contractor.